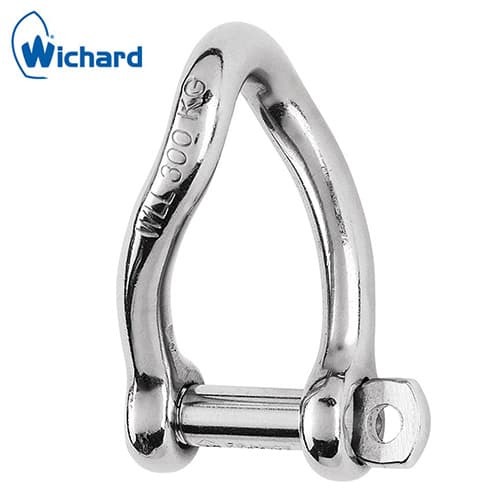 Stainless steel twist shackle suitable for highly corrosive marine environments, Wichard are renowned for their design and manufacture of high quality marine fittings. * Working Load refers to nautical applications, for lifting and industrial applications this is 1/6 of the break load. Versatile twist shackle with a 90-degree twist allowing for perpendicular connection of two attachment points without torquing, self locking pin designed to avoid accidental release due to vibration. Forged from 316L marine grade stainless steel, to a high polished finish. Wichard products are not designed for industrial lifting solutions. Working load quoted refers to nautical situations and should not be confused with the working load limit for use in industrial lifting situations. For lifting applications please refer to our range of Lifting Shackles.